A major earthquake struck the Loyalty Islands just before midday today. A magnitude 7.0 earthquake struck near the island of Mare in the Loyalty Islands at 11:43 this morning New Zealand Daylight Time. The quake was centred 82 km east-north-east of Tadine, 237 km east-north-east of Noumea, New Caledonia at a depth of 25 km according to the U.S. Geological Survey. The Pacific Tsunami Warning Centre also reports the quake as magnitude 7.0 at a depth of 25 km. An initial assessment by PTWC advised that hazardous tsunami waves were possible for coasts within 300 km of the earthquakeâ€™s epicentre. In a later bulletin issued at 12:54 NZDT, PTWC advised that tsunami waves of 22 cm had been detected at Lenakel Vanuatu, 28 cm at Mare and 37 cm at Ouinne New Caledonia. The Joint Australian Tsunami Warning Centre issued a bulletin at 9:59 AEDT advising that there was no tsunami threat to Australia. The earthquake was initially reported as magnitude 7.3 but, after further assessment, both the USGS and PTWC revised the magnitude down to 7.0. This morningâ€™s earthquake is the latest in a series of earthquakes that have struck the area in the past day. 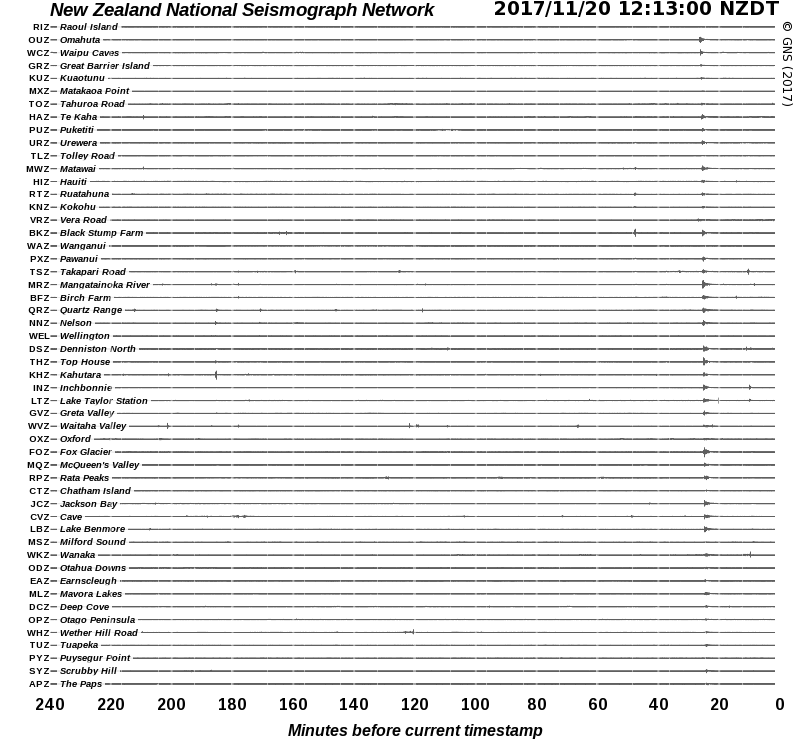 They include a magnitude 6.4 quake at 10:26 p.m. last night New Zealand time, a magnitude 6.6 earthquake at 4:09 this morning, and 13 other quakes of magnitude 4 and 5. 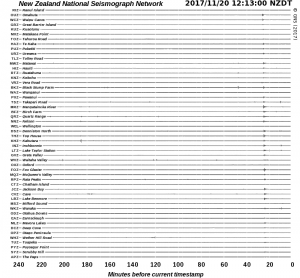 [click for larger image] The earthquake left a distinctive trace on GeoNetâ€™s national seismograph network. It was heard as a rumble here at Tawa and initially appeared as a magnitude 4.1 quake centred 60 km north-west of Whitianga on GeoNetâ€™s website. This â€œghostâ€ quake has since been deleted. This entry was posted on Monday, November 20th, 2017 at 12:12 pm and is filed under Earthquakes - Observations. You can follow any responses to this entry through the RSS 2.0 feed. You can skip to the end and leave a response. Pinging is currently not allowed.